Samsung's folding phone, widely reported as the Galaxy X (or Galaxy F) is coming, and it could be with us as soon as CES 2019. And now, thanks to a highly detailed video, we have a very exciting idea of just how crazy and experimental the Samsung folding phone could be. 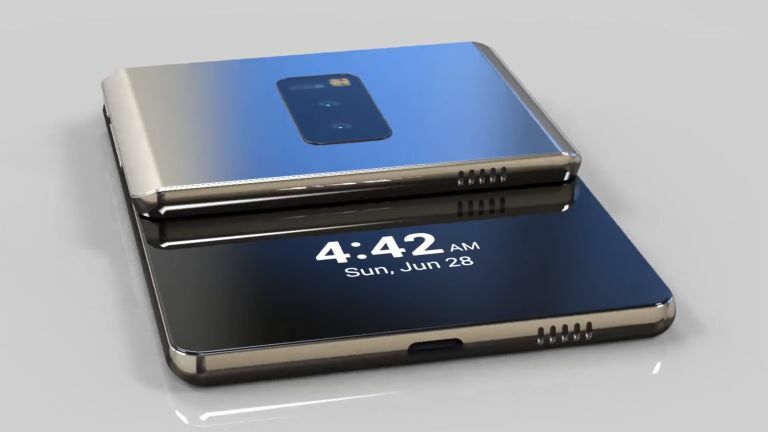 The folding Samsung Galaxy 2-by-3 phone video was delivered by smartphone industry designer TechConfigurations, who has a solid track record of generating interesting depictions of much-wanted new phones based on the latest industry leaks and rumours. The folding "Samsung Galaxy Wing" shown here features many of those rumoured features and hardware, too, including a 8MP f/1.7 secondary camera equipped with a retina scanner and face recognition, a dual rear camera array (12+12MP, F1.5/2.4) capable of 4K, 60fps video recording, a folding 7-inch, 4K AMOLED display with HDR 10, a powerful Qualcomm Snapdragon 855 CPU, and an in-display fingerprint reader. A folding Samsung Galaxy phone is one of the worst kept secrets in the mobile business right now, with the South Korean maker looking to reinvigorate the market with a bold new form factor, while also holding off challenges from Huawei, Apple, and LG. If the folding Samsung phone looks anything like this, then we're confident the South Korean maker will make a big impact.